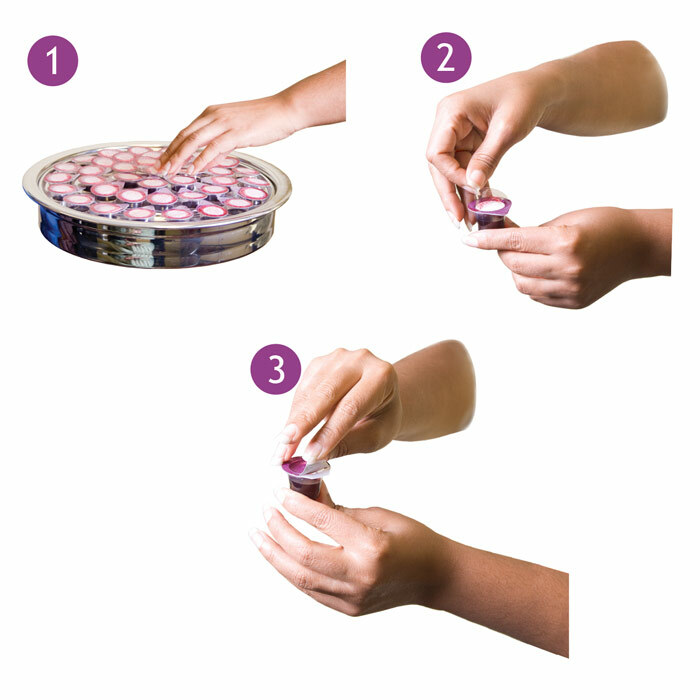 Prefilled Communion Cup with Wafers - Quantities of 500, 250, 100, 50, 12 and 4 and travel case of 8. Prefilled Communion cups from our store in Olympia, WA give you a prepackaged Communion solution that will transform your church Communion celebrations. You'll be able to celebrate Communion without the worry of spills, contamination and waste you once experienced with traditional Communion cups and wafers. Shipped fresh to you from a temperature-controlled, dust-free environment, you'll never worry about stale wafers or spoiled juice again. Celebrate Communion's new line of prefilled Communion cups are manufactured in a special way to guarantee freshness. Created out of recyclable plastic, the patented cup and wafer kit seals the wafer & juice separately in a unique and handy two-tab container that keeps the elements fresh, yet is extremely easy to open. Available in 3 Styles: With or Without Wafers & White Grape! We are able guarantee Saturday delivery for Communion supply orders placed by 6:30pm EST on Friday evenings (expedited rates apply). Prefilled Communion cups include a single portion serving of juice with a Communion wafer sealed in a separate compartment on top of the juice. This document contains a few basic instructions that will be a helpful overview for first-time participants. 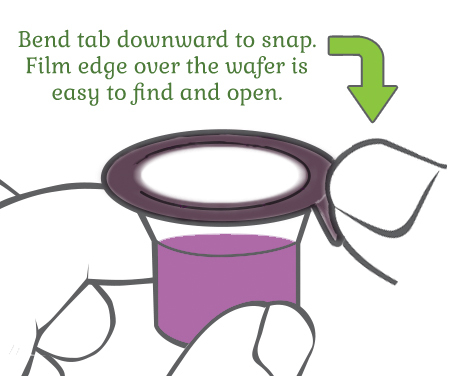 Both elements of Communion, an unleavened wafer and 100% grape juice, are individually sealed in one cup, ready to serve. Prefilled cups fit in all standard Communion serving trays. Serving time is significantly reduced by this convenient single-pass distribution! Another time-saving idea is to simply serve from a basket at the entry door or hand out cups with the church bulletin before service. However you choose to serve Communion, wholesome prefilled cups provide efficient distribution. Open the cup by pealing back the pre-cut tab on the foil seal to drink the juice. The grape juice stays so fresh tasting because of the unique hygienic seal. The prefilled cup is suitable for all ages and even Senior participants find the cups easy to open. Coach the members of your congregation to assist anyone in the church family around them that may need a helping hand. This can be a sweet, bonding time and it's what being in community is all about. Make sure to give instructions on where to place the used containers when Communion service is finished. These cups are recyclable. Based on the extended shelf life, any unused portions can be easily stored for future use. Celebrate Communion's prefilled cups are manufactured in a special way to guarantee freshness. Cups are shipped fresh to you from a temperature-controlled, dust-free environment. You'll never worry about stale wafers or spoiled juice again. Comprehensive testing procedures to inspect every batch will ensure a longer shelf life and quality control for a consistent seal. That means no worry of spills, contamination or waste. Prefilled cups are portable. Great solution for on-the-go events, travel Communion for shut-ins, hospital visitation, small groups, large services and increased attendance on holidays. Quick, no-mess setup takes the stress out of preparation. Volunteers can relax and focus on the spirit of Communion. Click for printable version of "Helpful Tips and Benefits of Prefilled Communion Cups"
Celebrate Communion shares your reverence and conviction for the Lord’s Supper. This passion drives us to seek creative opportunities to meet at His Table. When introducing our new travel case for prefilled Communion cups, we prepared a handy scripture reference card for portable ministry and visitation. You are welcome to download this printable copy of “Preparing Our Hearts For Communion” to share with your small group or Bible study.